Several skin cancers are known as non-melanoma cancers. The most common of these are squamous cell carcinoma (or SCC) and basal cell carcinoma (or BCC). These skin cancers are much more common in New Zealand than melanoma cancer is. They are especially common in fair-skinned people who have been exposed to a lot of sunshine through their lives. It is often easier to treat these cancers if they are caught early. The Cancer Society has useful information sheets on how to check your own skin. If you notice any skin changes that could be suspicious, get them checked by a GP straight away. Suspicious skin lesions include new or changing moles, freckles or spots. Also scaly or red patches, ulcers or sores that may bleed easily, itch or not heal. Your doctor will ask if you have had skin cancers before and about any risks you may have for skin cancer. They will look at your skin or the area you are concerned about. Sometimes your doctor will use a magnifying instrument called a dermatoscope. 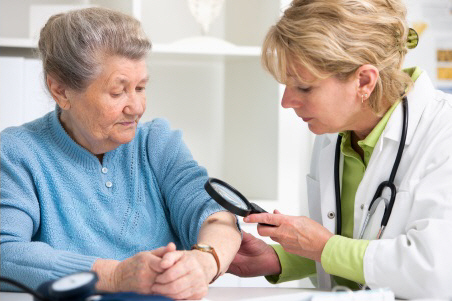 After an examination, your doctor may not be certain if your skin lesion is a cancer or not, as this is not always clear from the first examination. If your doctor thinks it could be a skin cancer they may recommend taking a biopsy (taking a small part of your skin lesion). Or they may recommend removing it by cutting it out (excision). They will then send the tissue that is removed to the laboratory to confirm what type of lesion it is. You can find more information about skin biopsy or removal (excision) of a skin lesion in this section. If your doctor thinks the lesion isn't a skin cancer they may advise you to keep an eye on it and return urgently if it changes. They may tell you to come back after a certain time so they can check it for changes. They may take a photograph of the lesion now and repeat it at set periods to look for changes (serial photography). Or they may seek advice from a GP with a special interest in skin lesions, or a dermatologist. Written by HealthInfo clinical advisers. Endorsed by clinical directors, Dermatology and Plastic Surgery, Canterbury DHB. Last reviewed September 2016.